Utilizing Utilities in Shareholder Yield - Epoch Investment Partners, Inc.
Epoch’s Shareholder Yield strategies earn investment returns by collecting regular and growing returns to shareholders in the form of cash dividends, share buybacks and debt repayments from high-quality companies. We believe a globally-diversified portfolio of such companies can produce superior results under most market conditions. Our initial approach to security selection is to screen publicly traded securities from around the world, without bias toward sector or country. Utilities stocks, those of companies involved in the generation, distribution and sale of electricity, gas and water, have historically fit the profile of shareholder yield companies and have remained a significant allocation of our assets, as shown in Figure 1. Our view on utilities seems to buck the current consensus on the sector. We understand that some investors have been looking at utilities as a bond substitute since interest rates stand at historic lows and may consider valuations to be stretched. In addition, some believe the sector will lag the market as interest rates rise. As we will discuss, we do not focus on the valuation of an overall sector. Rather, we focus on the fundamentals of individual companies, and believe that a number of factors will help the companies we invest in meet our shareholder yield expectations. 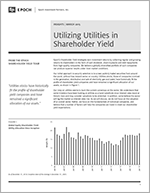 Consistent and growing dividends are critical elements of the Shareholder Yield strategy, and utility companies tend to pay attractive, above-average dividends. In fact, since the inception of the strategy, the utilities sector of the MSCI World Index has been one of the highest dividend-paying sectors in the Index, significantly out yielding the Index average (see Figure 2). Equally important, the dividend yield of the market has not fluctuated much while the market return as a whole has been volatile. While dividend yields in the utilities sector as a whole have trended downward over the past few years, we continue to find individual companies that add to the overall Shareholder Yield of the portfolio. Why do utilities pay higher dividends? Generally speaking, a higher dividend is a utility company’s way of attracting and rewarding investors who are particularly interested in cash dividends as a source of return. These companies have stable profits, which allow them to pay out a higher portion of their earnings as dividends. And, because of their stability, investors are usually confident that they will receive dividends at the expected levels, year after year. Of course, not all utilities pay consistent and growing dividends, so our investment team actively evaluates each company on its own merits, which illustrates why we avoid generalizing all companies within a sector and emphasize the importance of active management. Within the utilities sector, we have focused on regulated utilities rather than non-regulated utilities, due to the predictability of their cash flows. These companies are regulated by entities within their service areas and must present proposed pricing to their regulators for approval. The price often involves a calculation of the weighted average cost of capital (WACC) and thus, can change with interest rate levels. Since the demand for utilities like electricity, water, and gas is mostly stable, aside from the effects of weather and seasonality, demand on an annual basis is often relatively easy to predict. If we know the price a company can charge and the volume it can expect to sell, we should, with some degree of accuracy, be able to predict its cash flows. We then have only to determine what a company’s management intends to do with those cash flows. One example of a utility company with predictable cash flows is National Grid. This company derives two-thirds of its operating income from the U.K. Following a rate review by the British regulator in 2013, the company’s U.K. rate base was set through 2021, with 6% to 8% growth built in. Demand for its services has mostly been stable and in line with population and economic growth, and is expected to remain stable going forward. The consistency of their past performance and the stability of their future profitability give us confidence in our estimates of their cash flows. Within regulated utilities, we evaluate the regulatory environment of each company to understand if it will be positive or negative. For example, while the U.K. environment may be supportive, benefiting National Grid, the environment in Brazil has not been positive for CPFL Energia, an electricity generation and distribution company. For the period of 2011 through 2013, Agência Nacional de Energia Elétrica (ANEEL), the Brazilian regulatory authority, lowered CPFL’s allowed WACC from 9.95% to 7.50%. We anticipated that this would result in lower profitability and cash flows, negatively impacting the dividend, so we decided to exit our position. CPFL did eventually have to cut its dividend several times. There has been negativity around the outlook for the utilities sector, due to the perception that valuations are stretched and increasing interest rates will hurt the sector. The Shareholder Yield strategies do not take valuations into account in the traditional sense (comparing the P/E ratios of the utilities sector to those of other sectors to determine which is more attractive). Rather, we evaluate each investment candidate for its potential contribution to shareholder yield returns. The impact of rising interest rates does merit a closer look. While all sectors would experience the effects of rising interest rates, utilities could be more negatively affected as they tend to rely more heavily on debt issuance. To understand the effect of rising interest rates, we look at its impact on interest expense and discount rates and what companies have done to prepare for rising rates. As mentioned, higher interest rates would increase the cost of newly issued debt and the payments on variable-rate debt. We see two mitigating factors for utility companies, particularly the ones we hold in our portfolios. First, newly-issued debt in any time period will likely be only a fraction of a company’s overall debt load. Thus, the impact of higher rates from newly-issued debt will not have as much of a negative effect, when averaged into the company’s actual periodic interest payments. To illustrate, we looked at Duke Energy Corporation, the largest utility company in the U.S. Duke has $41 billion of total debt, nearly $3 billion of which is short-term debt maturing over the 12 months ending September 30, 2015. If it had to replace that short-term debt and add an additional $750 million for future financing needs in an environment where the interest rate has jumped by 1% – a sizable amount – the increase on its cost of debt would be only 0.07%. This increase is less than one-tenth of one percent, and would likely reduce the company’s overall cash flows by 0.6%. In addition, many companies have taken advantage of the current low interest rate environment to replace maturing higher-cost debt with new lower-cost debt. Duke had approximately $2.75 billion of debt with an average rate of 5.14% that had matured between June 2013 and June 2014. The company replaced that debt with more than $2.5 billion of new debt at an average rate of 3.81%, lowering its annual interest expense by approximately $50 million. Another example is Électricité de France (EDF), which owns a fleet of nuclear power plants in France, the U.K. and the U.S. In January 2014, it issued a $1.25 billion dollar-denominated five-year note at 2.15%, only 105 bps above the level of five-year Treasuries at that time, replacing a $1.25 billion note maturing in the same month, which had a coupon rate of 5.50%. With Treasury rates remaining low by historical standards and corporate bond spreads over Treasuries staying tight (see Figure 3), companies still have the opportunity to refinance their debt at costs that are lower than their current interest expense. A second mitigating factor for utilities, particularly regulated ones, is that they tend to have transparent business models that allow us to have confidence in their ability to generate strong and predictable cash flows. This makes it easier for us to understand whether a company will be severely affected by rising rates, or if its expected cash flow is strong enough to support increased interest expense while still paying planned dividends. We model various interest rate levels to determine the impact on a company’s cash flow. We put a high value on consistency of returns, so we build a margin of safety into our analysis and leave enough room for actual interest rates or cash flows to be higher or lower than the levels we modeled without a large impact on the portfolio. Looking again at National Grid, we ran sensitivity analysis on the effect of interest rate increases at various levels. If, for example, the company were to replace the debt maturing in the next year with debt issued in an environment with interest rates that were 1% higher, its average cost of debt would increase from 3.76% to 3.84%. This would reduce cash flows by only £60 million, compared to annual dividend payments of £1 billion. Given what we are looking for is a margin of safety, we are comfortable that the decrease in free cash flows from an increase in cost of debt would not significantly impact the company’s ability to pay the dividends it is expected to pay. In all sectors, rising interest rates would impact the discount rate that is used to evaluate the future cash flows of a company. As rates rise and future cash flows are discounted at the higher rate, the price of longer-duration instruments would fall faster than shorter-duration instruments (assuming all else is equal). Duration is not only a fixed-income concept, however. Stocks that provide shareholder yield — particularly dividends — are in effect shorter-duration than those that do not, since the cash flows are collected earlier. Thus, as the rates rise, these equities may actually be less discounted than those that do not provide shareholder yield and are, effectively, longer-duration. The headwind of rising rates could also be offset by growth in a company’s future cash flows. While utility companies tend to have lower growth rates than companies in other sectors, we have increased confidence in their achievement of growth expectations, particularly for those that are regulated. We can therefore confidently assess a company’s ability to generate the cash flow necessary to weather rising rates. The companies that we believe can achieve the future cash flow levels needed to offset rising interest rates are those that can meet the higher demand for utility services, maintain strong regulatory relationships, and have the financial strength to support and deliver growth. For example, the aforementioned Duke Energy is expected to increase its dividends by 4% to 6% through 2016, which is in line with its earnings growth. We believe this increase is likely because of anticipated growth in demand in Duke’s operating states (North and South Carolina, Florida, Indiana and Ohio), rate increases stemming from recent constructive regulatory reviews, and a strong balance sheet that allows it to finance growth with low-cost debt. Within our Shareholder Yield strategies, we do not invest based on the absolute level of interest rates nor do we adopt a view on whether rates will rise or fall. We do, however, evaluate how changes in interest rates will impact the individual companies we analyze and look for those companies that can consistently grow and pay dividends, regardless of the interest rate environment. While we do not manage sector allocation by design, the utilities sector has always been an important one for the strategy. We acknowledge that the sector as a whole may suffer with the rise of interest rates, but believe the utility companies we hold will deliver shareholder yield at the levels we expect, and an underlying growth rate to accompany that yield. By maintaining a diversified portfolio of companies from a variety of sectors that deliver on our expectations, we believe we can provide investors with an attractive return and relatively low volatility across market cycles.